Chromium helps maintain healthy blood sugar levels already within normal range. Crominex 3+ is a highly stable and biologically active form of chromium optimized with Capros amla Indian gooseberry extract to promote endothelial health and PrimaVie® shilajit for cellular energy. We all know vitamin D supports bone health. But vitamin D also promotes healthy cell division, supports immune system health, and more. Because of widespread vitamin D deficiency, nutritional scientists are calling for an increased vitamin D intake: 1,000 IU per day and higher. Our Two-Per-Day multivitamin delivers 2,000 IU of vitamin D3 with every serving. Vitamin C is famously associated with immune system health, an effect that may result from its ability to scavenge free radicals and protect against oxidative stress, as well its stimulation of the production and function of white blood cells. Additionally, vitamin C is vital to collagen formation, the connective tissue found throughout healthy arterial walls, skin, bones, and teeth. Our Two-Per-Day formula delivers 470 mg of vitamin C per serving. Our Two-Per-Day formula now contains 400 mcg of 5-methyltetrahydrofolate (5-MTHF), a form of folate that is up to seven times more bioavailable than folic acid. This is particularly important for those with certain genetic enzyme deficiencies, since 5-MTHF is already in a metabolically active form. For optimal health benefits, mixed vitamin E tocopherols are some of the most valuable forms of vitamin E. For biomarkers of oxidative stress and inhibiting inflammatory factors, evidence shows that combining alpha- and gamma-tocopherols is better than taking either nutrient alone. Our formula provides more than 80 mg of mixed alpha, beta, delta, and gamma tocopherols. A multivitamin is not complete without the minerals and other nutrients essential to healthy living. 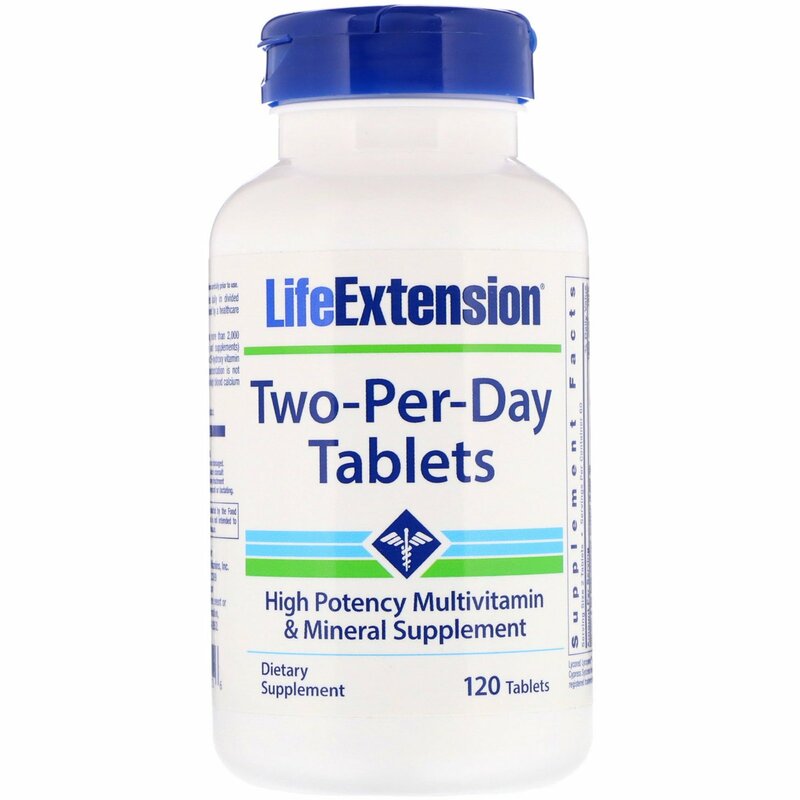 Our Two-Per-Day formula provides 10 times more biotin and twice as much zinc as Centrum Silver Adults 50+. 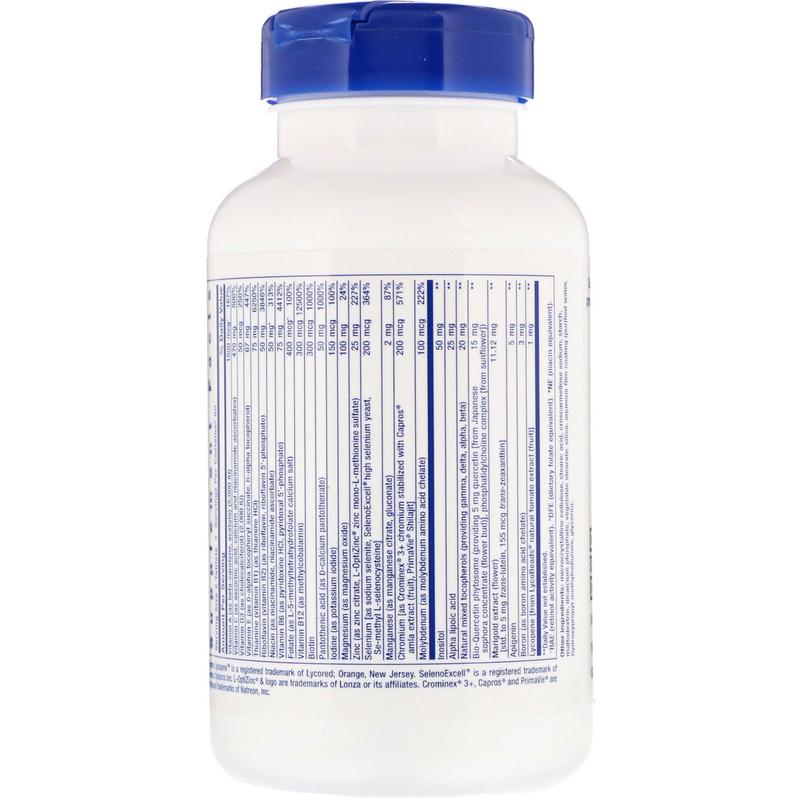 Our formula also delivers 100 mg of magnesium and 150 mcg of iodine, as well as trace minerals like manganese and boron. Alpha-lipoic acid — Alpha-lipoic acid is a potent defender against oxidative stress that promotes metabolic and nerve health, and helps protect vitamin C and glutathione against damaging free radicals. Selenium — Selenium supports heart and brain health, promotes a healthy inflammatory and immune response, helps quench free radical activity. Our-Two-Per Day formula has three unique forms of selenium (200 mcg total): SelenoExcell, Se-methyl L-selenocysteine, and sodium selenite, each form acting along a different biological pathway. Apigenin — This powerful botanical bioflavonoid is found in many fruits and vegetables. Apigenin helps boost the body’s natural cellular defenses. Everyone should be taking a daily multivitamin: there’s no simpler way to ensure your body is getting the essential vitamins, minerals, and nutrients you need to stay healthy and live better. But not all multivitamins are created equal — so choose the best: Life Extension Two-Per-Day Capsules. Microcrystalline cellulose, stearic acid, croscarmellose sodium, starch, maltodextrin, dicalcium phosphate, vegetable stearate, silica, aqueous film coating (purified water, hydroxypropyl methylcellulose, glycerin). ^RAE (retinol activity equivalent). °DFE (dietary folate equivalent). •NE (niacin equivalent).